I have been asked a couple of times now, to be more specific on where we live, people can't find it on maps. Well, that is probably because there are few maps over the area available on web tools. The beach you see on the satelite photo is the coast line. The right hand side of the beach is Victoria Island where the financial activities, shops, and schools are. Where you see the little blue baloon with an A on, is Ikoyi. That is the island where the Nigerian oil company and Statoil has their offices. From Ikoyi an artificial island is build, shaped as a banana? and given the name Banana Island. 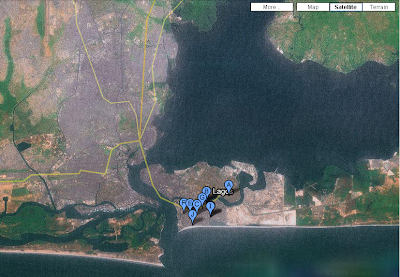 We live in the western part of Banana Island, with a great view over the lagoon and to mainland Lagos. Our neighbourhood consists of apartment blocks and churches. Some big, well funded chirches sponsored by European or American churches, other more locally funded. One of the later is found quite close to where we live. Music and singing heard early in the mornings. Plastic chairs and plastic church in use with an enthusiastic user group. Very loud music from such a small church. Situated close to a roundabout with heavy trafic is another church which has caught my attention - based on the cool name. The Church of the Assumption. To me that is summing up perfectly what churches and religion is all about. Well back to our neighbourhood. From the veranda we can see the local fishermen taking their small boats out in the lagoon chasing after fish and shrimps so they can feed their normally large families. Some morning I am wondering why I am not out there fishing instead of fighting trafic, going to the office. But given the numbers of fishers out there and the price of fish - I would guess that there already is a shortage of fish compared to fishers. So I better stay in the office and buy fish from them.